Fugitive Libyan leader Muammar Gaddafi's most prominent son has promised victory for Gaddafi loyalists faced with an ultimatum to surrender. 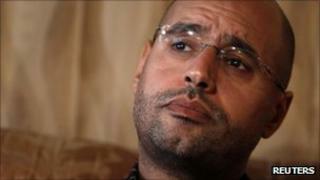 Saif al-Islam Gaddafi said he was speaking from Tripoli's outskirts, and that his father was fine. "The resistance continues and victory is near," he said in an audio message. International leaders, including UK Prime Minister David Cameron and US Secretary of State Hillary Clinton, are in Paris to discuss Libya's future. UN Secretary-General Ban Ki-moon will also be present at the "Friends of Libya" conference, hosted by French President Nicolas Sarkozy. Some 60 countries and organisations will be in attendance. They include Russia, which on Thursday announced it was recognising the National Transitional Council (NTC) as Libya's legitimate authorities, and China, which has announced it will send a vice-minister to Paris. Members of the NTC are expected to press for the release of further funds in addition to the $3.1bn (£1.9bn) in frozen assets released by the US and UK in the last two weeks. On Wednesday, £140m in Libyan banknotes (280m Libyan dinars) was flown by the British air force to the country, the first tranche of £950m that will be handed to Libya's Central Bank. The defiant message of Saif al-Islam was in contrast with that of his brother, Saadi, who earlier on Wednesday said he had been authorised to negotiate with interim authorities to end the fighting in Libya. But Libya's interim leaders have made it clear they are not interested in negotiating and Gaddafi loyalists have been issued an ultimatum to surrender before Saturday. Anti-Gaddafi commanders say they are moving to encircle the city of Sirte, Col Gaddafi's birthplace and one of the few areas of Libya still under the control of Gaddafi loyalists. But in his message, Saif al-Islam warned against any such attack, saying there were 20,000 armed people ready to defend the city. The BBC's Kevin Connolly in Tripoli says the Libyan capital feels stable and Saif al-Islam's threats have a delusional feel. The two brothers were always quite different. Saif al-Islam was supposed to be Col Gaddafi's heir apparent and he is coming out with very aggressive statements, as he has since this crisis started back in February. A very different tone is coming from Saadi Gaddafi, like Saif educated in the west and a fluent English speaker. He says he is speaking with his father's authorisation to try to negotiate an end to the bloodshed. I've spoken to a good friend and associate of Saadi Gaddafi who confirms that this process has been going on for some time, that he has been sending out lots of emails every day, making lots of phone calls. He says he worries that there could be a prolonged war, particularly if one of the very important tribes here - the Warfalla - is attacked by rebels, on the suspicion that they may be harbouring Col Gaddafi. The Gaddafi family appears divided, he adds, and if there is any clear impression to be drawn from the messages it may be that the Gaddafi clan is not in the mood to accept defeat - although it differs over what the next step should be. The messages from the Gaddafi brothers followed reports that rebels had captured Col Gaddafi's Foreign Minister, Abdelati Obeidi. Reuters news agency said Mr Obeidi was arrested at his farm in Janzour, a suburb of Tripoli. The whereabouts of Col Gaddafi are unknown. On Monday, his wife and three of his children crossed from Libya into Algeria. In his message broadcast on al-Rai, a Damascus-based station, Saif al-Islam said he was "speaking from the Tripoli area". "We would like to assure people that we are steadfast and the commander is doing well," he said, adding that he had walked through areas of the capital on Wednesday afternoon. "We will soon come to the Green Square to salute you, God willing," he said. Tripoli's Green Square was renamed Martyrs' Square after rebels entered the capital and overran the Gaddafi compound at Bab al-Aziziya last week. "We must wage a campaign of attrition day and night until these lands are cleansed from these gangs and traitors," Saif al-Islam said. Saadi Gaddafi's message was reported by al Arabiya TV. He said he had got in touch with the National Transitional Council (NTC) commander in Tripoli after being authorised to negotiate by his father. "If my surrender stops the spilling of blood, I am ready to give myself up tonight," he said. Abdul Hakim Belhadj, the NTC commander in the capital, confirmed that he had spoken to Saadi. "He called and revealed his intention to come on the side of the rebels," he told Reuters. "We told Saadi we would guarantee him decent treatment in line with the human rights, legal rights of any Libyan person." There has been a lull in fighting in Libya as rebels join in the celebrations for the Muslim Eid al-Fitr festival. However, reports said clashes were continuing around the town of Bani Walid - one of the places alongside Tripoli and Sirte where Col Gaddafi has been rumoured to be hiding.